In March I wrote a post about the beauty of pocket charts. 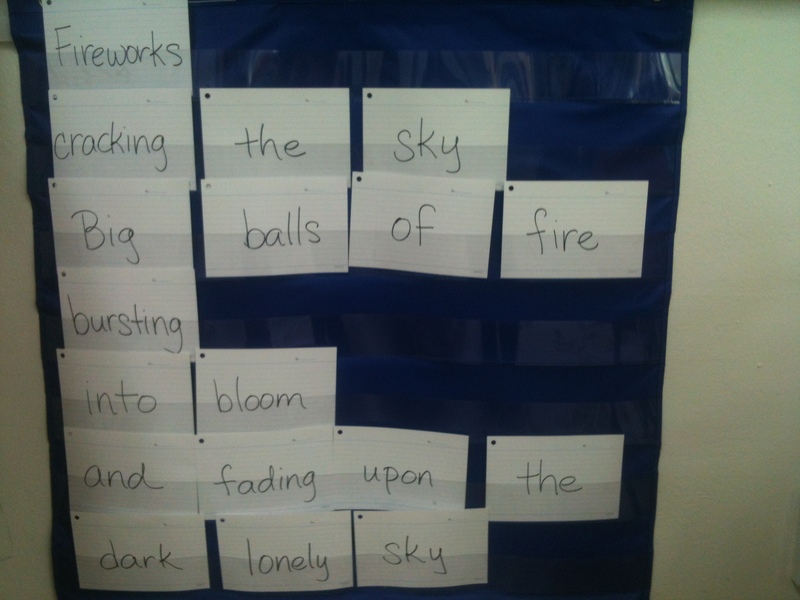 During my unit on poetry I have another way to use them! Last year, my teaching partner and I worked with our literacy specialist during our poetry unit, and she gave me a lot of great ideas. Here is one of them (it can also be found in Luck Calkins book Poetry: Powerful Thoughts in Tiny Packages). 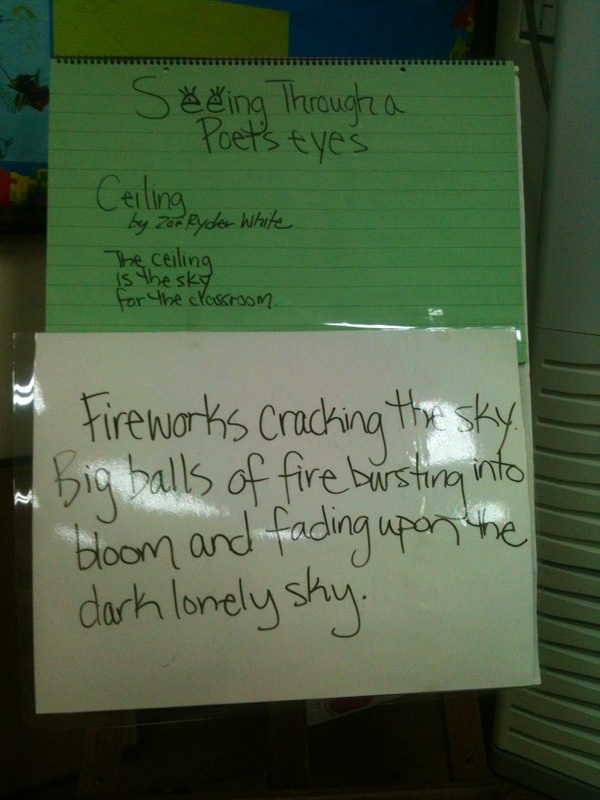 Try the poem in a multiple ways, and have the students take turns reading it aloud. It is amazing how each student reads it in their own unique way! Model for them how you would read it. 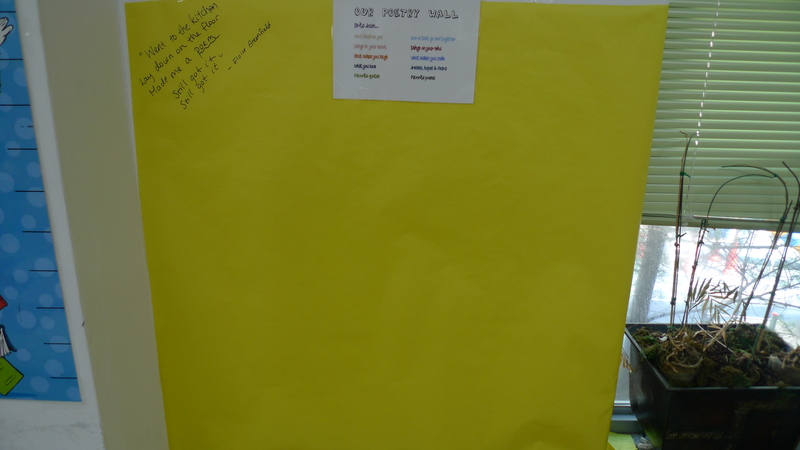 You can also lay the words on the floor first and have the students move them, and then put them into the pocket chart. Another idea, have students write a poem on index cards and test it out in the pocket chart, to see where they want their line breaks, during center time. One of my favorite things to do in our poetry unit is have our students go on a poetry walk. 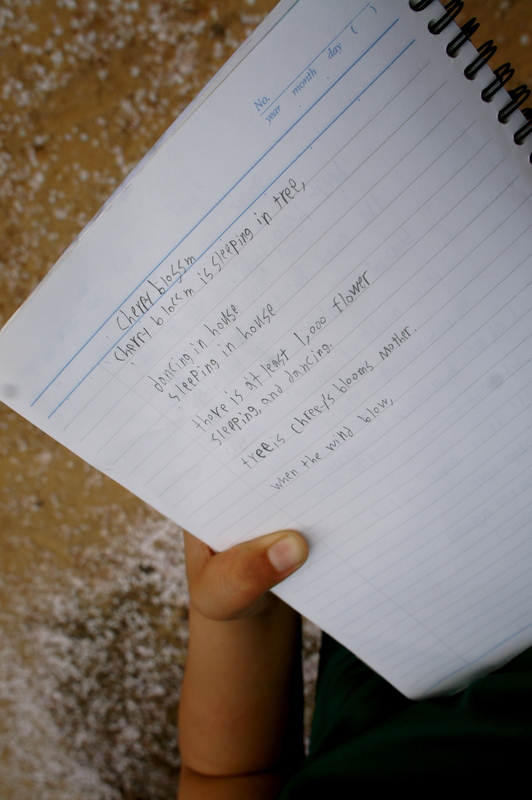 I have my students take their writer’s notebook and a pen with them and we take a walk outside. 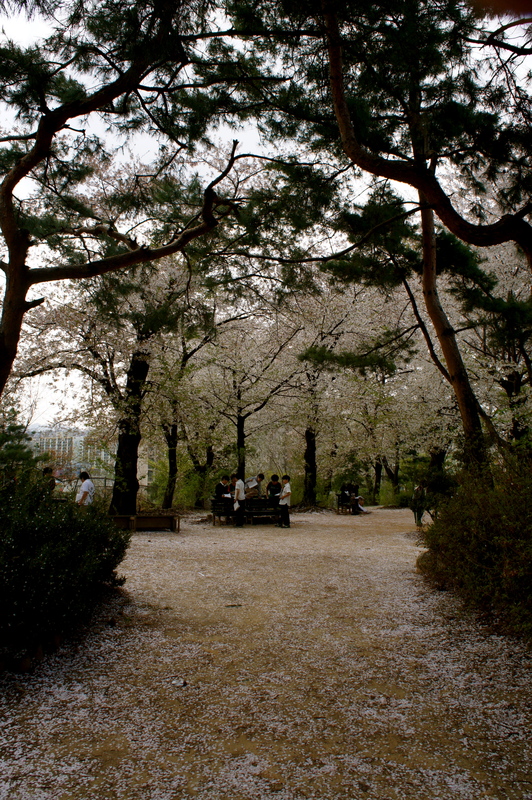 Last week, the beautiful cherry blossoms were everywhere outside our school. Our amazing guidance counselor was telling me about this beautiful hidden area on our campus with cherry blossoms. She said, “It would be a crime to not allow the kids to see this…” So we took our 5th grade classes and went to a small park area on our school campus. 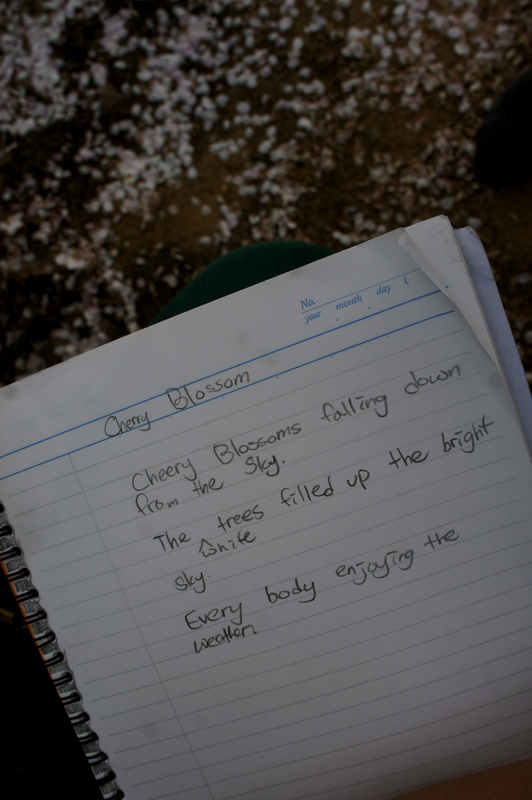 The students got to write down what they saw and be inspired by nature to write down poems. 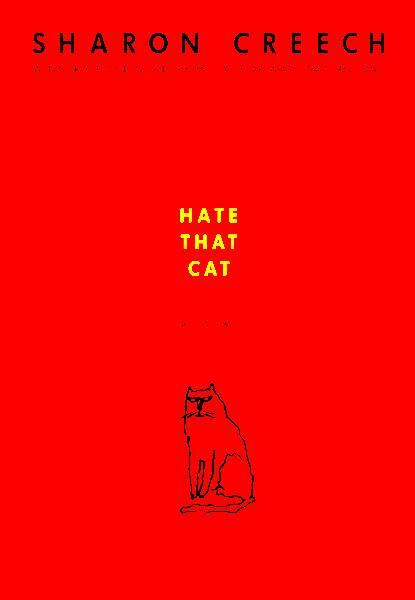 My all time favorite poetry read aloud books are Sharon Creech’s, Love That Dog and Hate That Cat. These two stories follow Jack on his journey with poetry and the teacher Miss Stretchberry that pushes him along the way. It’s a story that kids and adults can appreciate, smile and learn from. On Sharon Creech’s website, you can find some good teaching resources for using both books! 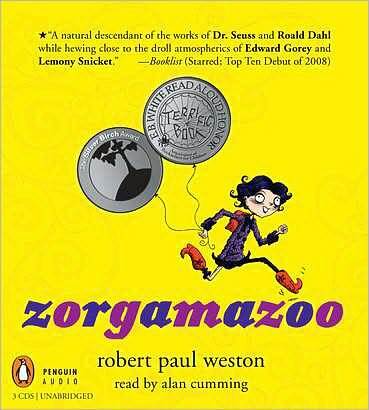 Another fun poetry read aloud book is Zorgamazoo by Robert Paul Weston. This book was recommended by another 5th grade teacher. I did get to read the book, but didn’t get to read it to my kids. It’s a fun fantasy story written all in rhyme. 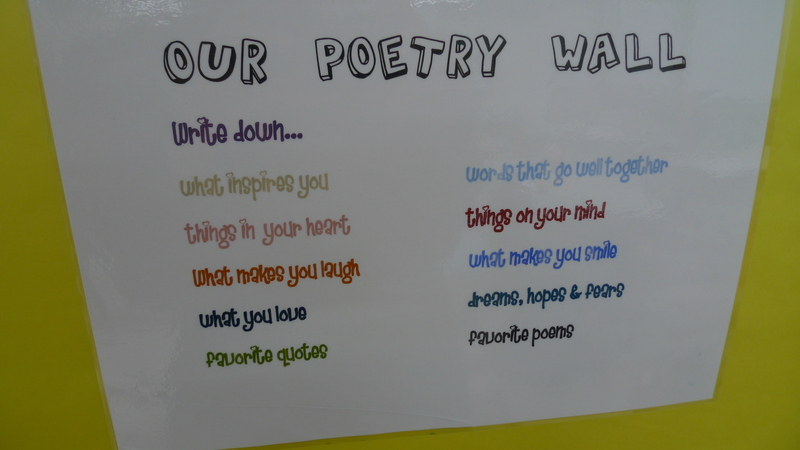 It would go well during a poetry unit for upper elementary kids! 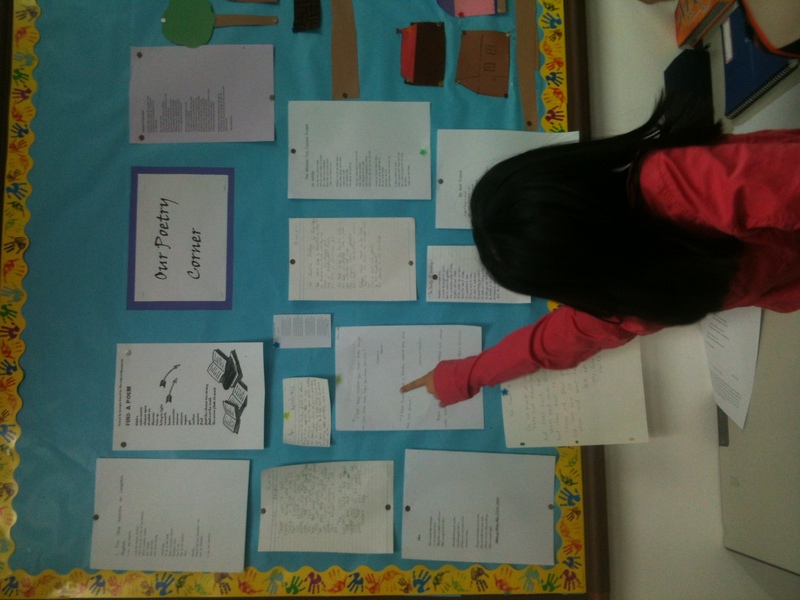 Here are some other good poetry resources! 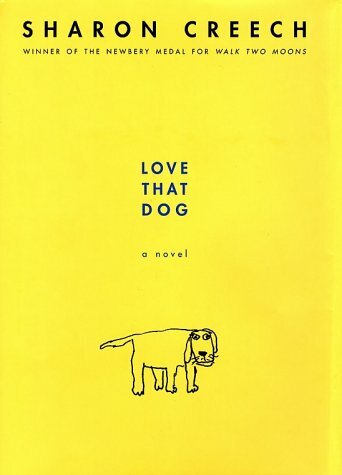 Do you have any good poetry read aloud books or resources that you recommend?